Dr. Chang, the New York-based classical pianist, has performed extensively worldwide on five continents as a recitalist, soloist with orchestras, and in various chamber music ensembles. In 1995, she gave her recital debut in Australia, and subsequently performed at Die Stiftung Schleswig-Holstein Musik Festival in Germany, and at Carnegie Weill Hall in New York City. Joanne came to the prominence as the Second-Prize winner in the National Taiwan Piano Competition and as the string prize winner in the National Taiwan Viola Competition. Continuing her studies in Australia, Joanne was awarded a four-year scholarship towards her Bachelor's degree in Australia, where she graduated valedictorian and received a special honor. She has been awarded many scholarships and prizes: The President Award, the Piano Workshop Award, First-Prize in the Yamaha Keyboard Scholarship competition, the Kerrison Piano Scholarship, and two Queensland Piano Foundation Scholarship Awards to name a few. These and others are the tributes that have propelled a career as a pianist on the stages of major concert halls in North America, Europe, the Far East and Oceania. Highlights of performances include Fazioli-sponsored solo tours in Taipei, Tainan, Hsinchu and Kaohsiung in Taiwan; in Bern and Olten in Switzerland; at QPAC, the Queensland Multi-Cultural Center and the Ian Hager Recital Halls in Brisbane, Australia; Colden Auditorium at Queens College; and at Hunziker Theatre at William Paterson University. In New York City she performed a concert at Merkin Hall sponsored by Artist's International Inc. and has performed at Symphony Space and Steinway Hall as well. She has performed in many other cities including Las Vegas, Los Angeles in the US; Johannesburg and Durban in South Africa; and Kunming and SuCho cities in China. Dr. Chang has also established herself as an interdisciplinary researcher (music and psychology). She has several publications in scientific peer-reviewed journals such as Psychology of Music and Medical Problems for Performing Artists. In addition to concert performances and publications, Dr. Chang is a multiple grant award winner: three PSC-CUNY Grants, two G. Shuster Fellowships, three Travel Awards from the State of New York and the Diversity Grant. Moreover, she has performed on television and on radio at WYNE 25 and WHLC AM in New York; DaiAi TV in Taiwan and the New Tang Dynasty and Chinese Television System in Australia. A sought-after music educator, Joanne has given master classes at the Governor School in South Carolina and the Vivace Music School in Brisbane, Australia; and workshops and presentations at Oklahoma University, Lehman College, the Asian American/Asian Research Institute, the College Music Society conference in Boston; Jin Si Hall in Sucho city, China; and at Taipei National University of the Arts in Taiwan. As an active advocate of contemporary repertoire, Joanne has introduced audiences to premiers of the commissioned works of composers Timothy Polashek, I-Wen Huang-Wong, Hsin-Jung Tsai, Davide Zannoni, and George Brunner. She was invited to be the soloist for the inaugural concert of Four Temperaments by Hindemith with the Taipei Symphony Orchestra at the National Concert Hall in Taiwan. 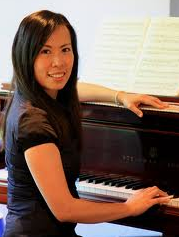 Her recent appearances include solo and various chamber ensemble settings at the Manhattan Center, City College, SUNY Purchase, St. Joseph College in New York; Oklahoma University in Norman City; City Hall in Guiyang City, Tzu Chi Foundation in Shanghai City, China; and in Johannesburg and Durban in South Africa. Joanne received her undergraduate degree from Queensland Conservatorium of Griffith University in Australia, her Master's degree from the Manhattan School of Music, and her Doctoral degree from Columbia University. Her teachers include Tai-Cheng Chen, Constance Keene, Karl-Heinz Kammerling, Natasha Vlassenko, Mykola Suk Valida Rassoulova and Lev Vlassenko. Currently, Joanne Chang is an Associate Professor at Queensborough Community College of the City University of New York.